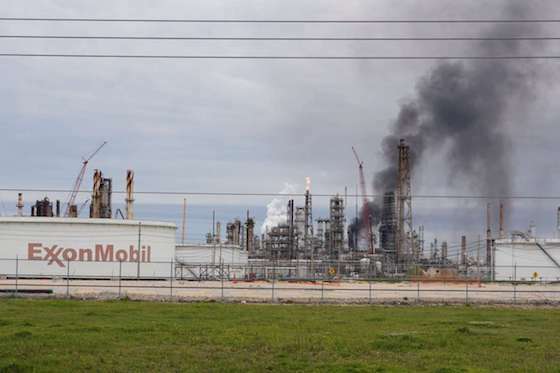 Smoke is shown at Exxon’s Baytown facility where a fire broke out Saturday. Cause of a fire that broke out Saturday at the ExxonMobil refinery in Baytown, TX, remains under investigation. The blaze broke out Saturday at 12:30 p.m., affecting a unit the company said processes motor gasoline. It sent a thick cloud of dark smoke into the sky. The complex located 5000 Bayway Drive in Baytown. ExxonMobil confirmed the fire at the facility, but were not sure of the cause of the incident, but it is under investigation. The fire at the refinery was contained and no injuries were reported. Exxon and La Porte Office of Emergency Management officials said there was no need to find shelter-in-place locations. Pollution control teams say they are continuing to monitor the air in La Porte and Clear Lake.